The new generation of Cyron ® 7" “Urban”™, now with 20% more power, is a wide angle headlight designed for city street riding. Perfect headlight when passing/fog lamps are not being used. Also compatible with Jeeps, Hummers, and FJ Cruisers. Lights have built in white and amber Daytime Running Lights behind two ultra clear lenses. Dedicated DRL wires for amber and white light make it possible to turn on DRL lights independent of the headlight. They can be connected directly to the ignition or spliced in with low beam wire. Built-in electronic EMI filter eliminates radio noises normally created by LED headlights. 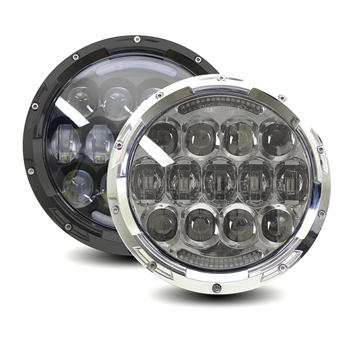 For matching Harley passing lamps look up Cyron ABIG4.5-A6K or AB881-A6K. Jeeps, Hummers and FJ will have plenty road coverage since there are two headlights. For cars purchase of two units is required. Consult your motorcycle manual for type of bulb and the fittings. 1 year limited manufacturer warranty. DOT COMPLIANT. 2014+ Harley models with dual headlight bulbs will require wire harness adapter ABIGC2A (HD# 69200897). Consult your vehicle user manual for type of bulb and the fittings. 1 year limited manufacturer warranty. Not DOT tested yet designed according to DOT specifications. Batwing Fairing and Nacelle buckets that currently do not have stock LED daymakers require ABIG7-RNG trim ring bracket for the proper alignment of the headlight beam. Available in chrome and black for perfect match to the headlight. Please check the link for a complete list of models. ***** Must notch the plastic plate inside the headlight bucket to provide room for headlight breathers. A blade or 5/8" drill bit will do the job.